Winter months can be hard on me mentally. It is cold here averaging about mid 20's to 30's each day, very little sun, and oh the snow..yuck. I have been very bad about spending time under the nice warm electric blanket reading and drinking tea. What I should be doing is making and blogging.. but oh the basement is SOOO cold unfortunately that is where the studio and the computer happen to be located. Here I am with lots to share. Lets start with my dear blogging friend Marie who sent me a package full of giveaway goodies that helped to warm my heart. As Ms. Maria and I opened each little gift we ohhhed and ahhed. 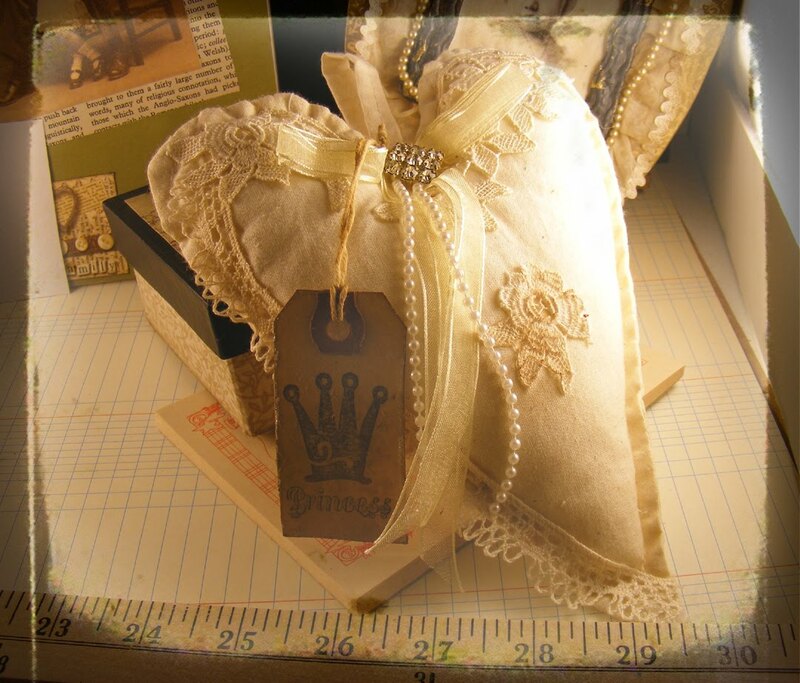 Oh the vintage goodness, the creams and browns... look at this heart with lace, ribbon, pearls, delightful rhinestone button and stamped aged tag! This little box was hiding within a lovely stained crochet piece and an altered bottle cap. 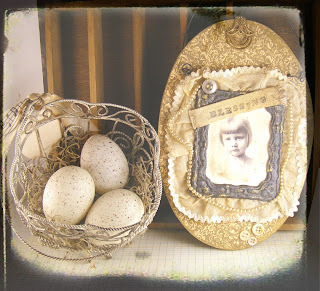 This plaque she made is stunning..the paper, the little girl, all embellished with vintage style trims. 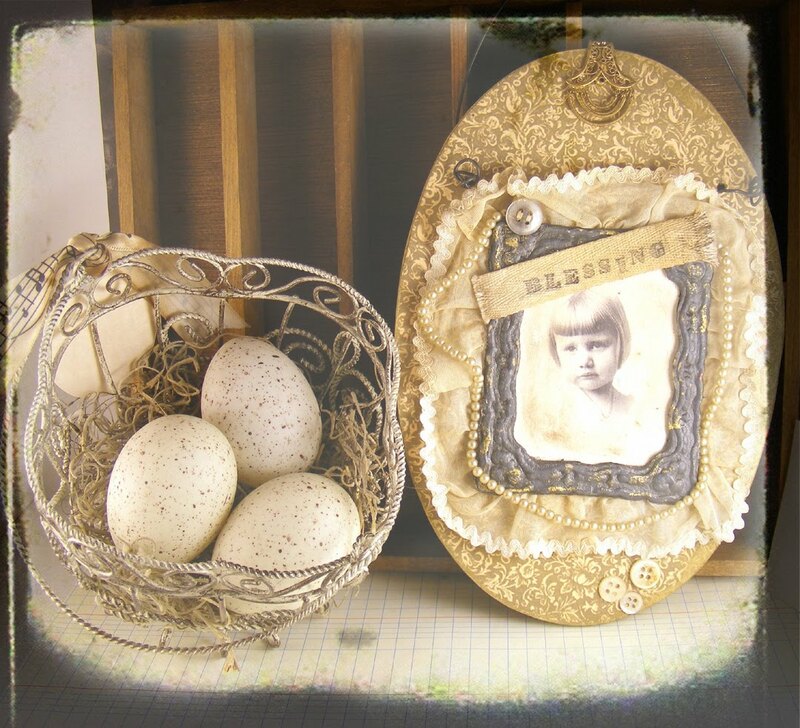 Then speckled eggs in a basket, I've been thinking for days on the best place to put them so I can look at them all year round. A little pad of paper with a folk art snowman had a sweet note from Marie, and finally hiding at the bottom of the box an altered journal. 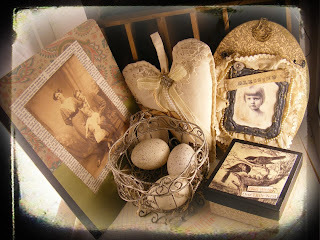 I remember reading on her blog about her lucky find locating these journals to alter..just darling. Marie you totally out did yourself, always so kind and generous!! It is always a treat read your blog daily and of course, to win one of your giveaways. But there's more to share...I joined up to participate in Bead Soup...for the first time. I really want to try some new challenges and this will be a great one. 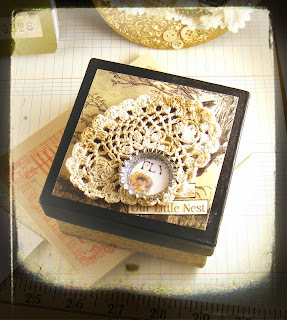 Lori Anderson of Pretty Things absolutely outdoes herself with this blog party where you are partnered up with another blogger ...swap a mixture of beads...make beautiful jewelry and share your work. 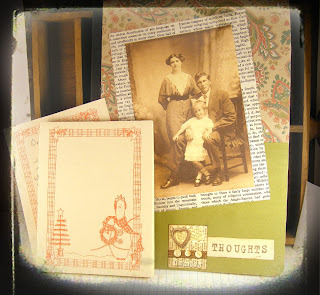 I've been partnered up with Janet of Singingwoods, she puts together some beautiful combinations. You can check out her blog and her shop if you have a moment. You so deserved to get all these goodies!! What a treat; they are all special. I still have such wonderful memories opening mine that I received from you! I will never forget it! I have been so busy that I haven't visited much, but your last few posts are lovely as always! I so understand the workshop being cold as my craft room is in our garage (well won't be for long)& it has been up til this week in the cold temps also. I have been packing out there this week for our move. I just wanted to stop by & say Hi to one of my favorite bloggers!! What lovely lovely gifts. Love them all!! Lucky girl to receive such a wonderful giveaway! I understand about the 'hibernating' - I have been doing a bit of that myself. I'm so glad you liked the giveaway goodies! It was certainly my pleasure to send them to you. The bead soup party sounds like great fun ~ I can't wait to see all that's created. I visited Janet's Etsy shop. She has some beautiful pieces in it. The necklace that she has on her blog - the one she made for last year's bead party is amazing! what a lovely and beautifull bunch of goodies from dear Marie.I love it all, and the beautifull sepia and cream tones, makes it so beautifull to look at all year round. The party sounds great fun- so maybe that can give a little fun to this cold, and grey dayes-believe me , I have lots of them here, too. Hi Angie! Good hearing from you. Sometimes keeping up with the blog can be hard, right? ;o) Love the fantastic goodies Marie sent you. You are on lucky girl. Sounds like that gift of the electric blanket was perfect! It is icy where you are! What lovely treasures you recieved in the post. Yes they are so beautiful to see all the year round and with memories of your Dear friend. Im happy as a Sparrow (they are happy lol) to be your BEAD Party partner! Let the PARTY roll on! Hi Angie, how wonderful to get such vintage goodness in the mail. Gifties always perk up the spirit. The winter blahs can get to us all. Been off the blogging wagon myself lately...Mr Romantic stole the batteries from my camera for the remote,lol. As far as creating goes, do it when the bliss hits is my motto. :) I always love what you share though. Have fun with the swap!